Are you a tourist in New York who’s about to wait on line at TKTS? Are you having doubts about whether standing around for two hours in order to buy tickets that at 50% off will still be over your limited budget is the best way to spend your limited time in New York? Well, here’s a much a better idea: Spend your afternoon doing other fun thing – preferably outdoors since this is an unusually cool and fantastically beautiful summer day, and then spend two minutes online buying tickets for under $30(!) 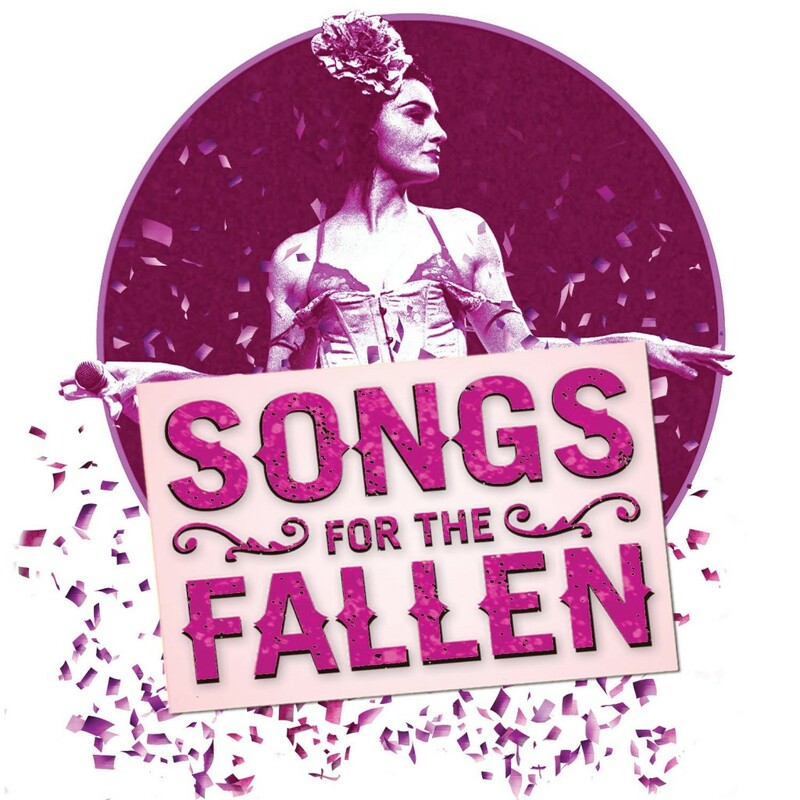 and with no bad seats in the house to see the spectacular musical Songs for the Fallen, at Theatre 3. “But is it on Broadway?” You ask. You didn’t come here from the boonies to see community theater – even though when we do community theater in this town it usually involves an equity cast. Theater 3 is at 311 West 43rd Streets, a stone’s throw from Times Square although throwing stones in the City is illegal and a very bad idea so don’t try it. However, geography does not make a Broadway show. The house is tiny, so technically it’s “off-Broadway” even though you’ll still have the thrill of walking through throngs of other confused people from out of town just like you who unlike native New Yorkers walk slowly and block the sidewalks. And besides, Songs of the Fallen probably won’t be sending a touring company out to wherever it is you live real soon or ever. It’s a completely unique theater experience, and also (again like you) not a New York native. The show originated in Australia and was written by and stars Sheridan Harbridge – a unique Aussie talent, who is gracing our town for one week only, so unless you’re planning an upcoming trip to Sydney, this is your only in New York, only chance. The real Marie in her box at the opera, where she was the show. Here’s the premise – Marie Duplessis the legendary 19th century courtesan is celebrating her 23rd and final birthday – and you’re invited to the party — which of course takes place mostly in the lady’s boudoir. Harbridge takes you on a tour of Marie’s life from her humble and melodramatic origins – her father sold her to to the Gypsies among others – to her “career” as the pretty play thing of just about everyone who was anyone, through her passionate love affairs, and finally to her miserable death of consumption at age 23. Sounds absolutely operatic doesn’t it? 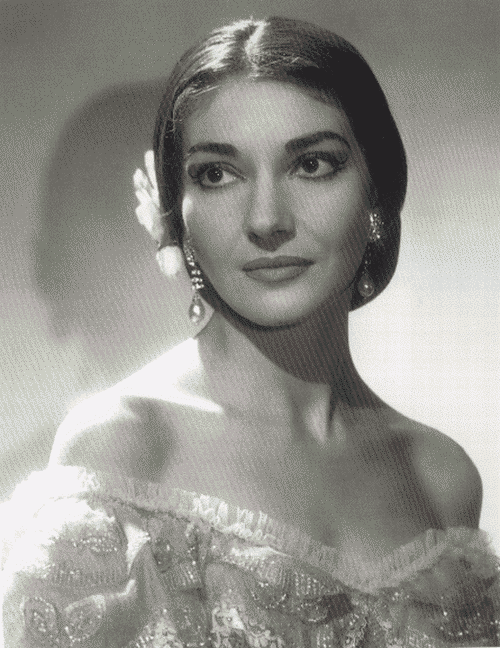 Of course it does because Marie’s life story inspired the novel The Lady of the Camellias, which later became the play Camille, which was seen by Giuseppe Verdi who turned it into La Traviata, and then came the movies. She’s the most famous woman you probably never heard of. Harbridge manages to capture in her songs, her patter and her performance, Marie’s sexiness as well as her vulnerability, but even more, she captures her charisma. She so embodies the spirit of Duplessis. that despite a strong script and great tunes, it’s almost impossible to imagine anyone else playing the role. There’s even, dare I say it, a little bit of Judy Garland, whom Harbridge has also portrayed, in her Marie, and while one wouldn’t think of the two as having much in common, it makes sense. Both were self-destructive survivors whom we couldn’t help loving. Duplessis – the real one – and not Verdi’s saintly Violetta, was capricious and greedy. If tuberculosis hadn’t killed her, alcohol, venereal disease, or just hard-living probably would have soon enough, as it did many of the grandes horizontales, yet Harbridge manages to portray all that while also making her Marie completely sympathetic, and charming. 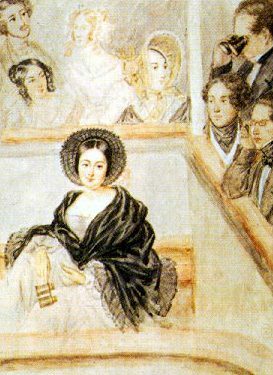 Capturing the horror of Marie’s childhood quickly without overstating the case, we understand her “hunger” for life as well as for all the accoutrements – expensive clothes, fine food, a private carriage, champagne, a box at the opera, etc that constituted the good life. While the show is presented as a “comedy,” Harbridge manages to connect Marie’s story to the story of all the lost girls then and now, forced to survive however they could. While she could easily hold the stage as a solo performer, Harbridge is ably assisted by two other actors, Garth Holcombe and Simon Corfield playing all of the people in Marie’s life. Also on stage is the one man band of Basil Hogios. Granted, given my own Duplessis obsession, of course I was inclined to love the show, but I never expected to be quite this blown away. I began a little Duplessis project of my own shortly before Julie Kavanaugh’s excellent biography of Duplessis, The Girl Who Loved Camellias came out. But in Kavanaugh’s well-documented version, Marie, who didn’t leave us any diaries, or many of her letters, remains, despite the details, enigmatic. Harbridge manages even in a fourth-wall breaking, anachronistic, sometimes absurdist, 90-fast paced minutes cabaret, to make her real — flesh, blood, body, and soul. See it if you’ve seen La Traviata more than once, or not at all. See it whether you’re a Duplessis fan or you’ve never heard of her. Just see it. And despite my opening, it’s not only for visitors, but for New York theater geeks, and people who make it to a show once or twice a year, opera buffs who want to see a more realistic version of their favorite noble demimondaine, and people who just want a good time, but get your tickets NOW as the run ends July 27th and there aren’t many seats left, and who knows when you’ll get another chance?